If you don’t like the taste of coconut, please know that you really can’t taste it at all. You can mostly taste the cashews and caramel goodness of the dates. So delicious!! 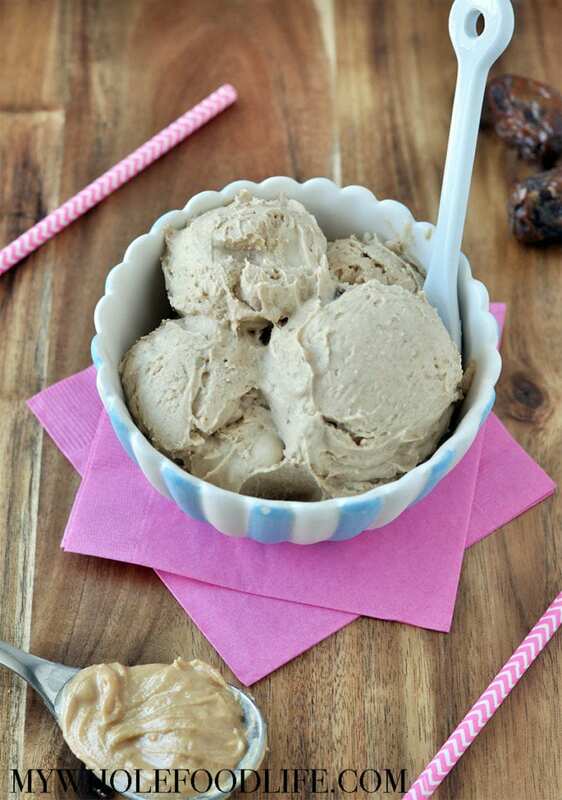 This healthy and decadent ice cream is sweetened only with dates! Make sure your ice cream bowl has been in the freezer for at least 18 hours before making this recipe. Drain the dates and add them to a blender . Blend until smooth. Then add the sea salt and blend again. Set date mixture aside. Add the coconut milk and cashew butter to the blender and blend until smooth. Pour the coconut milk/cashew mixture into the ice cream bowl and turn the ice cream machine on. It should take about 15-20 minutes to make ice cream. When the ice cream looks about halfway done, add the date caramel to the mixture and finish making the batch. Transfer to ice cream tubs and store in the freezer. I like these tubs . This should last in the freezer for at least 3 months. Enjoy! This ice cream makes a soft serve. If you like a harder ice cream, place the ice cream in the freezer for a few extra hours to firm up more. What do you do if you don't like dates? Because, I don't so I can't make any of the dishes that have them in it and lately a lot of recopies use them. How about figs? I can see those working too. Hi, I avoid coconut milk/cream/oil. Do you think the recipe would work with homemade cashew milk? Thanks. Yes! I think that would be good. Please let me know the results if you try.